NHS Creative is based in the New Forest National Park and we are ‘Creative by Nature’ in every sense of the word. 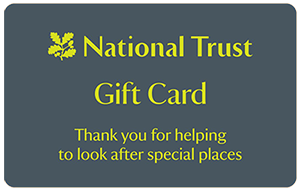 We’re offering one lucky competition winner the chance to get closer to nature and to explore and protect special places with a National Trust Gift Card. It can be used to purchase a National Trust family membership which gives you year-long free admission to over 500 places. Alternatively you can put it towards holiday cottage bookings and spend it on National Trust on-site cafes, shops and restaurants in England, Wales and Northern Ireland and within the online shop. To enter, you’ll need subscribe to our mailing list and answer the question by filling out the form on the right. Open to residents of the Channel Islands, Isle of Man and the United Kingdom aged 18 or over. All entries must be made directly by the person entering the competition, no group or mass entries will be accepted. Employees of NHS Creative, as well as the immediate family (spouse, parents, siblings and children) and household members of each such employee are also not eligible to enter. The closing date for receipt of all entries is 28 February 2019 at midnight. Entries received after this time will not be accepted. Entries will be accepted via the NHS Creative website only. There will be one winner; the winner will be the first correct entry drawn by NHS Creative at random from all eligible entries on or around 1 March 2019 from all entries received across the competition. The winner will be notified by 15 March 2019 and will be contacted by email. The prize may be withdrawn from the said winner and a new winner drawn if the prize is not accepted within seven working days of notification. If NHS Creative is unable to contact or validate a prize draw entrant within a reasonable time, we will return to the overall pool of entrants and choose the next participant at random. Our decision in respect of all matters to do with the promotion will be final. If you are the winner of this prize draw, you agree that NHS Creative may use your name, image, job title and employing organisation to announce the winner and for any other reasonable and related promotional purposes. You further agree to participate in any reasonable publicity required by NHS Creative without any financial reward. By entering this prize draw, you agree that any personal information provided with your prize draw entry may be held and used only by NHS Creative to administer this prize draw. NHS Creative reserves all rights to disqualify you if your conduct is contrary to the spirit or intention of the prize draw. NHS Creative reserves the right to hold void, suspend, cancel, or amend this prize draw where it becomes necessary to do so. Gift cards cannot be used for other telephone or online purchases. Gift cards are not valid against the purchase of more gift cards. Our cards cannot be accepted at certain on-site outlets not operated by the National Trust. Nothing in these terms affect your rights at law (for instance, under the Consumer Rights Act 2015). Please see the Citizens Advice website at org.uk for more details. The main exception properties are Giant’s Causeway, Carrick-a-Rede, St Michael’s Mount, Porth y Swnt – Aberdaron shop, Tatton Park, Wakehurst Place, Buscot Park, Ascott and Waddesdon Manor where gift cards cannot be redeemed or purchased. Please confirm your permission for us to send you our ‘Creative Brief’ E-newsletter, along with other occasional service updates and promotions. We promise not to bombard your inbox and we’ll only send information that we think you’ll find useful. To enter fill out the form below and after you’ve clicked subscribe you will need to confirm your email address to enter the completion – please check your mailbox (and/or spam) for the confirmation email. Good luck. Please note that if you’re already a subscriber to the NHS Creative mailing list, you’ll need to subscribe again for the purposes of entering the competition. We will ensure that you do not receive duplicates of any future emails.